We opted to order a bunch of things to share so we could try more things. Nearly everything arrived at once: first up, eggplant fritters. Both of us had expected more like eggplant mashed into a beignet/doughnut/zeppole dough before being fried, so we were surprised to find thick slices of eggplant breaded and fried. I thought this was okay, though the name on the menu was completely misleading. I’m not really sure why I took such unfocused photos – too busy gabbing away, I suppose? – but this was a scallop dish, served with sauteed mushrooms on the side. The scallop – yes, singular – was sweet and cooked properly, but again, nothing stood out about it. I really don’t know what I was photographing, since this dish – the pate – well, you can barely see it! I thought the pate was once again just OK. It was creamy, and perfectly spreadable, but nothing notable one way or the other. After my recent positive experience with mussels (literally 3 days prior to this) – plus Hungry‘s comment to me when I mentioned where I was going for dinner that La Carafe often had moules frites specials advertised – I mentioned this to Felicia, and she was game. For $17, you could pick your choice of broth, the dish came with a giant portion of frites that were slightly soft but otherwise a great accompaniment, and a glass of house wine. I found these pretty good – plump, cooked properly and not mealy or dry like I dislike in mussels – and just overall, very tasty. I was just starting to think that maybe I’ll start actually liking and eating mussels again, after a long hiatus from eating them – I tend to find them overcooked, crumbly, and unappetizing – when disaster struck. I take my share of responsibility for this occurrence; having little to no experience really eating mussels like this, and certainly having not eaten more than one or two at a time in very spaced apart periods over the course of the last 30 years, I didn’t recognize the signs of “don’t eat that” – I ate one that tasted slightly off. I mean, it didn’t taste as good as the others, but I shrugged and instead of spitting it out, I swallowed it. I am fully aware that one bad mussel in a pot doesn’t mean all of them are bad, and that the onus is on the eater here to not eat food that’s spoiled, as the kitchen just can’t know if a closed mussel, once it’s steamed open, has turned, and they aren’t going to sit there and check each mussel before serving a whole pot of them to us. I have a very funny stomach, and many friends have suggested that I’m insane because there’s no way I could immediately feel ill effects of food. Whatever, I’ve been like this my whole life (and my mother is as well); within 15 minutes I realized something was wrong. However, we had tickets to Peter & the Starcatcher, so I didn’t say anything and just prayed that it would pass. Towards the end of Act 1, though, when I broke into a cold sweat and probably turned 6 shades of green, I knew I wasn’t going to make any longer and rushed out of the theater (which is something of a no-no, but I’m sure the people I disturbed to get out of my row preferred being disturbed for 45 seconds over me throwing up on them). That mussel wanted OUT and it was going to come OUT, STAT. I know this is a food blog, so I won’t give more details other than… yeah, I missed the last 10 minutes of Act 1 and the first 5 of Act 2 in order to calm my cramping and aching belly. Having said all that, though, I don’t find myself holding it against La Carafe. While the food was all very middle-of-the-road, it was enjoyable enough with very reasonable prices that I see no reason to refrain from returning simply because I had one bad mussel. Felicia was fine, and we shared everything. It really is less a jab at them and more my lack of experience eating mussels that caused this issue. 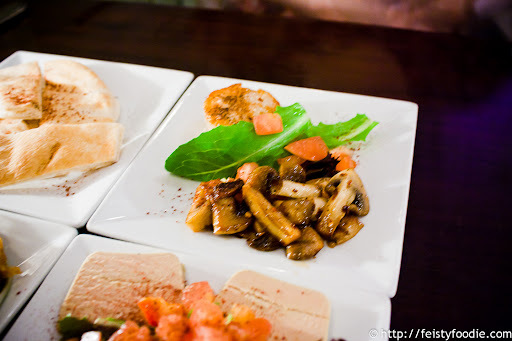 Yvo says: Extremely reasonably priced pre-theater dining, with pleasant service, good location and nice decor. I believe they are also on Restaurants.com if you want an even bigger discount. While nothing will blow your mind, it is a solid choice for a few bites before a show, or just to catch up with a friend. Oh no! Bad seafood is the worst! Tip to keep in mind: if you need to pry open a cooked bivalve to eat it’s meat, it’s bad. Toss it. Should be WIDE open after cooking. Sorry to hear about your bad mussel experience! I never really liked mussels myself. More of a clams kinda gal!